but it can be hard to achieve. With an estimated A1C you can start to see how your efforts are paying off. so your results will be most accurate once you’ve been using D Sharp for a little while. We prefer the D Sharp method, which is based on the trapezoidal rule. This rule approximates the region under the graph of all logged blood glucose and then adjusts for the difference in capillary blood and average plasma glucose. You may also see the application of this rule credited as the Tai Method. We’ve also provided the American Diabetes Association Guidelines (ADAG) method, the Diabetes Control and Complication Trial method (DCCT) and the Nathan Formula. Your healthcare provider may prefer one of these other popular methods. This graph shows you BGs as points over 90 days. The green band indicates the target range of 4 to 7 mmols. The green line represents the moving average for this user. 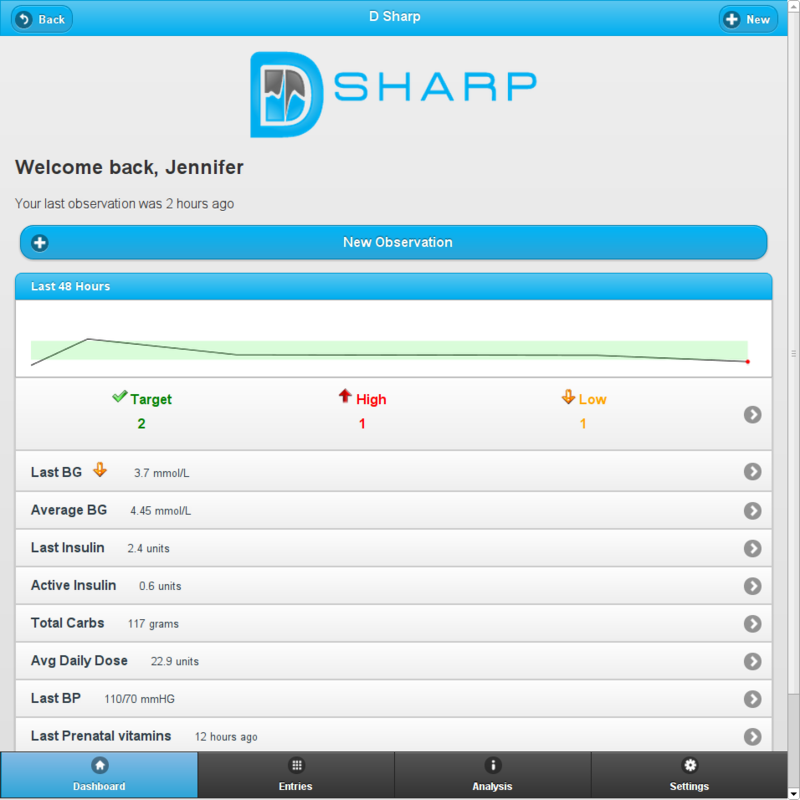 The graph visualizes D Sharp’s method of the trapezoidal rule and indicates that this user has maintained a healthy estimated A1C despite having BGs that fall above and below target. SMS reminders are sent to your smartphone or feature phone if more than four waking hours have passed since your last entry. A busy life means it’s easy to forget about recording your diabetes. These little reminders are a friendly way to help you stay on track. This feature can be disabled if your data plan does not cover unlimited texts. A Personalized Dashboard for at-a-glance entries and trends in the last 48 hours is a your diabetes homepage. 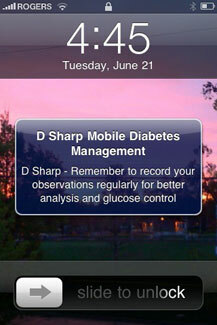 There will be days when you want to see detailed reports and charts of your diabetes. Maybe you’re looking for trends in BGs after exercise or suspect you are missing a dose of medication and want to find a new routine. On most days, you’ll probably want a quick check to see if you’re on track. Each entry will start with your dashboard, where you can quickly scan the numbers to look for changes. 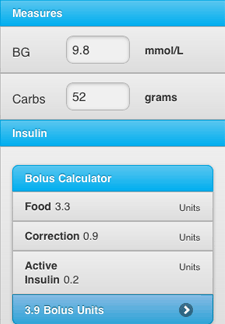 The Insulin Calculator uses your type of insulin, weight, insulin sensitivity, carb-to-insulin ratio and active insulin to calculate your bolus delivery. This feature will help you with the sometimes complicated math of figuring out your bolus. 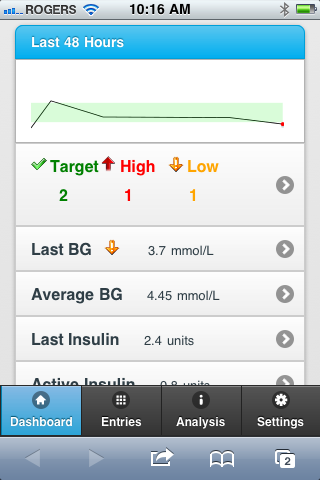 Unless you use a pump with a bolus wizard, this feature is not available to most people with diabetes. Calculating active insulin means a correction will be added or subtracted when a BG reading is higher or lower than your target. It’s especially important to keep your log up to date when using this feature. If D Sharp doesn’t know about insulin in your system, it may suggest an insulin dose that is higher or lower than what is needed.